Private 3/2043 Edwin Hancock, Kings Own Yorkshire Light Infantry. Edwin Hancock was killed on the 7th of May 1915. Unfortunately there are no service papers for Edwin. Information found so far suggests that this man is the Edwin Hancock born at Park, Sheffield c. 1877/8. This would have made him app 37 by the time the 1st WW broke out which seems a little old. This man is on the 1911 census still living and working in Sheffield and therefore suggests he would have been older than the usual recruit even had he enlisted between 1911 and 1914. I would be grateful for any information at all which might clarify the issue. Interests:Rugby League and fig rolls. 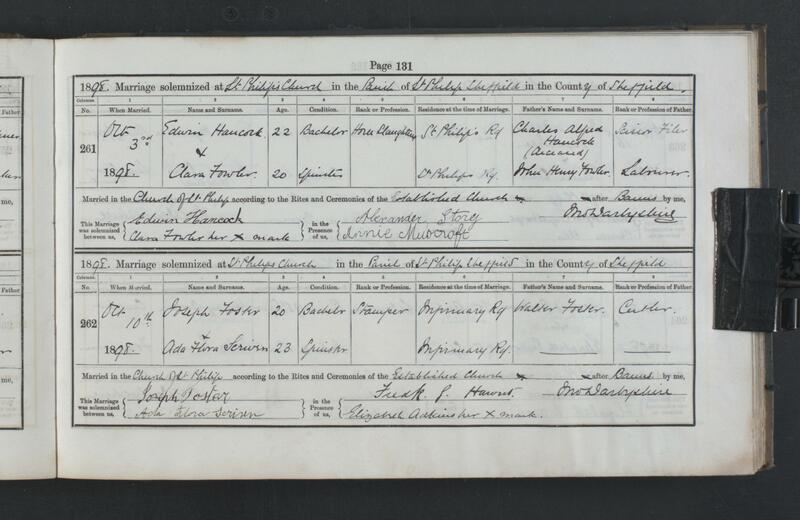 Sorry I can't add anything Military to this post, but there is an entry for Wakefield Prison for a Edwin Hancock aged 18 in 1896 doing 6 months for warehouse breaking and stealing sheep's skins. He is aged 18 5' 61/2 in height with L Brown hair and looks like he is due for release 8th October 1896, register number 1863. The age is certainly right for him and if he was a Sheffield man that makes it more likely too. Plus from 1901 onwards he was employed as a Horse Slaughterer which although a stretch may mean his place of employment also dealt with sheepskins which might have given him the idea to steal some. Is this information on Ancestry or some other source? Yes it is in Find my past under British newspapers. he worked at where he robbed from he was led astray. Thanks for this too - it certainly sounds like him. I am at the library later this week and will have a look in the newspapers of the period - any idea when he was actually sentenced? I know I am playing on your good nature but do you have the date of the newspaper in which this appeared. I have checked the Independent on the British Newspaper Archive without success. 9th April 1896, it was the spring 1/4 session assizes and reported in the Sheffield Evening Telegraph of that date, he also had to do hard labour as well. The Police where waiting for them, the article is under the heading of Caught in the act. Meanwhile I will keep looking for him in military records. that avatar of mine is my granddad who survived the great War and served in Y&L Regiment. That's very helpful of you and very much appreciated. It should make it much easier for me to locate the article. I was looking in the Independent and not the Telegraph which I don't think is available on-line anyway. I have Edwin Hancock's First World War medals hence my interest in him. The avatar is a great image. Neither of my grandfathers served in the Great War but my maternal Great-Uncle was killed on the 1st of July 1916. No problem, if you don't find it let me know and I will copy it for you, in the mean time I am giving you a link to the Soldiers effects register. That's the one syrup, also the Sheffield Evening Telegraph from the day before. Firstly - thanks syrup for posting this article which I greatly appreciate . You have saved me some trouble. Roger - thanks for your link but unfortunately my Ancestry subscription is one level below that which would enable me to view the Soldiers effects pages. Many thanks to you both for taking the time and trouble to respond . I would have posted that article for you, but I thought you wanted to have a search for your self(lol). This Edwin is def your man, I checked census's birth and marriage certs and also the effects register states his things where to go to widow Clara. Attached is a copy of his entry in the Effects Register. There is a red stamped box entitled War Gratuity and it's possible to work out roughly when he joined up, looks like 1914 with having the Star. Once again many thanks indeed for your generous help. 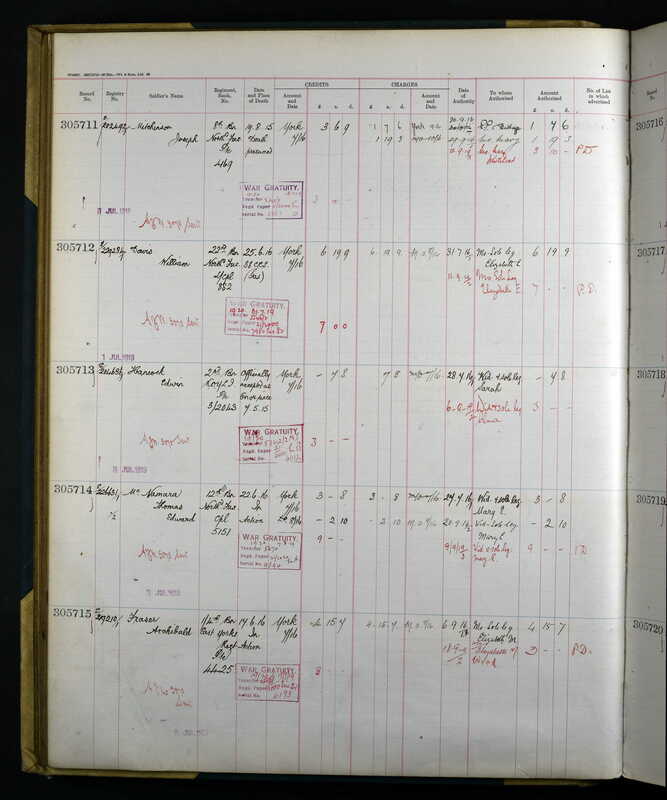 In the absence of his service papers I was trying to establish as much information on Edwin, to positively identify him, as I could but was therefore restricted to births, marriages, census etc on Ancestry. As I am sure you are familiar with, there is also the facility of checking on who else might have been researching the same person and on looking at that link I found two family trees - both of these dealt with that Edwin Hancock who was born, as I say, circa 1877/8. Now you could be forgiven for thinking that those researching had just dropped on this man and made certain assumptions but at the same time it occurred to me that someone within those families would recognise other family names thus confirming this was the right Edwin Hancock. However, if it is the right Edwin, then the Register of Soldier's Effects etc throws a small spanner in the works as his wife and sole beneficiary is called 'Sarah'. Records for the Edwin I thought it to be show that his wife was called Clara not Sarah (this could of course be an error on behalf of the compiler of this record as the names do sound slightly similar) However I can't now find a Sarah Hancock who was married to an Edwin. I had hoped that there may be a mention of his death in the local press which might have included either details of relatives or even an address but it seems this will not be the case although I do intend to check later in the week - a laborious process but one which might prove beneficial even though it seems that your newspaper checks have not revealed a possible article after all. A frustrating but still fascinating business - I enjoy the research aspect of my collecting as much as the collecting itself if not more. Ignore my last diatribe. I have just read through the Soldier's Effects form again - this time using a magnifying glass and the 'Sarah' has been corrected to 'Clara' in September 1919. So, the mystery is solved and this is my Edwin Hancock for definite. Plus of course if I had read the information you posted before posting a copy of the actual page I would have noticed this straight away. Patience has clearly never been my strong point! My pleasure entirely. Some times I get in front of myself as well(lol). What I have noticed is most of the KOYLI's records where destroyed in WW2. The people next door to use are doing heavy renovations so me and the wife have been out most of the day. As I said yesterday there is a way of working out the nearest possible date of him joining, there is a chap on the Great War Forum(GWF) who as studied it I will ask him if he can work it out for us, we know when he landed in France it's on his MIC. I suspected it may be possible to establish an enlistment date from his service number. I will see what else I can find also. I have heard back from the GWF chap, due to him having only the basic rate it indicates he had under a years service and the closest he can get is very late August/ very early September. Sorry, the closest we can get. No worries at all Roger . Thanks for this latest addition to the growing file on Edwin.